Tickets: This is a free and an unticketed event. All Welcome! 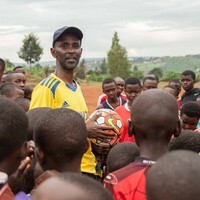 2019 marks 25 years since the 1994 Genocide against the Tutsi in Rwanda and this event will involve a screening of the controversial film ‘Hotel Rwanda’ which will be sensitively introduced by Eric Murangwa, who himself is an eyewitness to how the Hotel was a place of sanctuary in 1994 at which time Eric was the goalkeeper for the Rwandan football club of international stature, called Rayon Sports Football Club. He and most of his immediate family survived the genocide in part thanks to the courage and humanity shown by his Hutu teammates and the role of the Hotel Rwanda which he passed through during the genocide, but many members of his wider family and his friends were murdered during the 100 days of genocide. We will have a free screening of the film which is set in 1994, filmed mostly on location in Kigali and released in 2005 by United Artists, directed and produced by Terry George. After the film, our host, Canon Mark Oakley, the Dean of St John’s College Chapel, a committed human rights activist, will Chair the Q&A with Eric Murangwa and the audience. Eric will highlight the difference between the film story and the real experience inside Hotel Mille Collines. He will also reveal why it has become necessary for the UN to officially correct the term ‘Rwandan Genocide’ to deal with genocide denial and adopt a new term of ‘the 1994 Genocide against the Tutsi in Rwanda’. Eric will help guide us to an understanding of how the film is problematic.